In the run up to Sunderland AFC’s Netflix debut; Sunderland Til I Die, due for airing on 14 December 2018, Ryehill Football thought that we’d take a look at another sample of The Art Of Sunderland AFC. 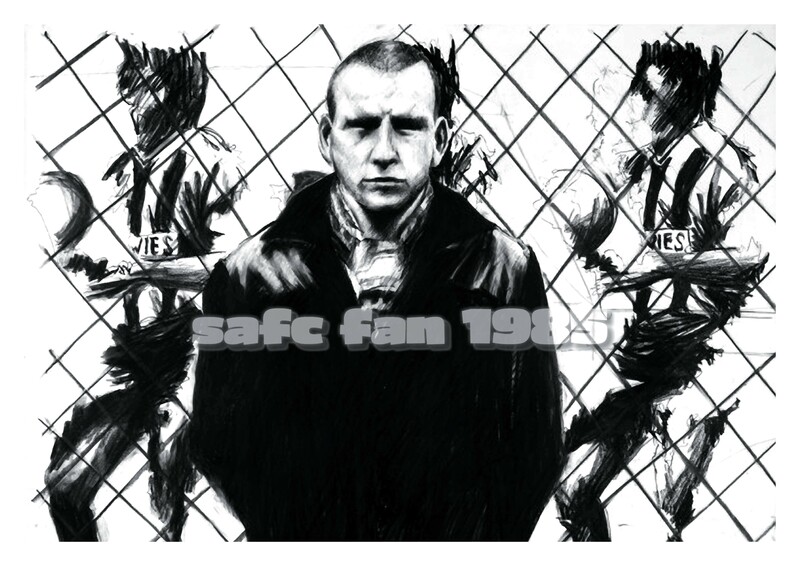 Those who frequent the site may recall that we had a first instalment of this a couple of years ago (search and you will find) and since that time more SAFC art has emerged. 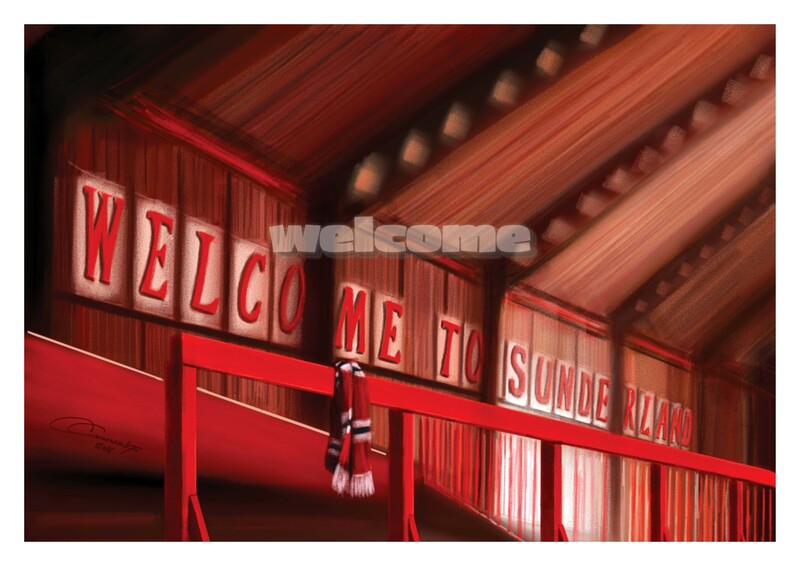 For those who have followed Sunderland AFC long enough each piece of art, courtesy of artists such as Chris Cummings (check his work out, its superb), evokes memories. However no matter how long ago they were and no matter how hard time tries to make us forget, they will never be forgotten. Similar to the “attack, attack, attack” scoreboard at The Roker End I remember that the “Welcome To Sunderland” message at the back of The Fulwell End was a source of some ridicule when it went up. However as memories of Roker Park now are, things that once perhaps seemed crass do not appear so anymore. Artist Chris Cummings has taken a raw piece of architecture and turned it into a warm and fuzzy footballing memory. The colours are beautifully fused and it evokes an almost fire light glow. And what of the scarf? One last act of defiance from a Sunderland fan refusing to leave Roker Park or a deliberate act of leaving part of you inside the ground? Whatever this evokes in you it evokes in me a thousand red and white memories. I was a 60’s child and although born in Durham I spent my early years in Edinburgh. There was one pastime and that was kicking a football around with my mates, anywhere we could. Games were disorganised, they were impromptu. 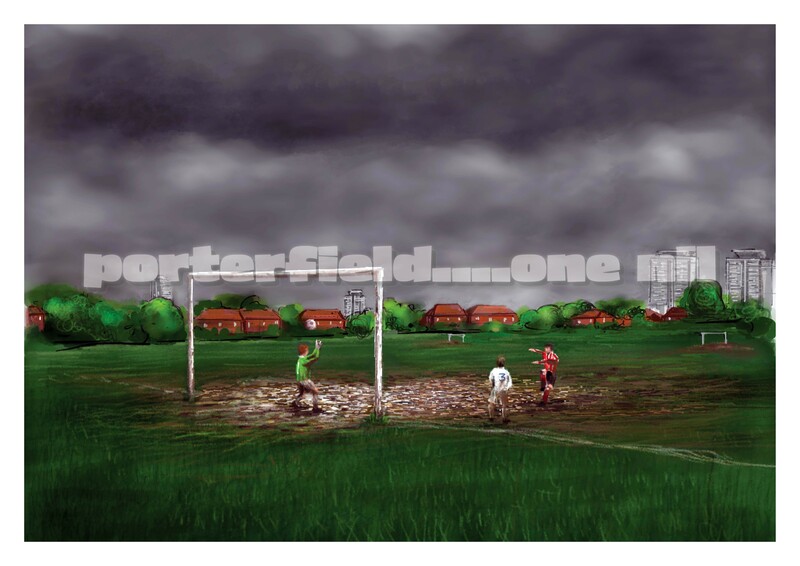 Jumpers for goal posts, some times a street light was one of the goal posts and the never ending arguments about some facet of our game; the shot that we swore never went in, who would be goalie and other timeless classics from football’s backyard. This image evokes all of that plus of course the added vital ingredient, the playing out of an actual incident in a football match. This one of course needs no description. Ian Porterfield not only scored at Wembley in 1973 but he also scored a thousand times on the playing fields of Sunderland, Hendon, Silksworth, Easington, Durham and beyond. A moment in time never to be forgotten, captured brilliantly by the artist. 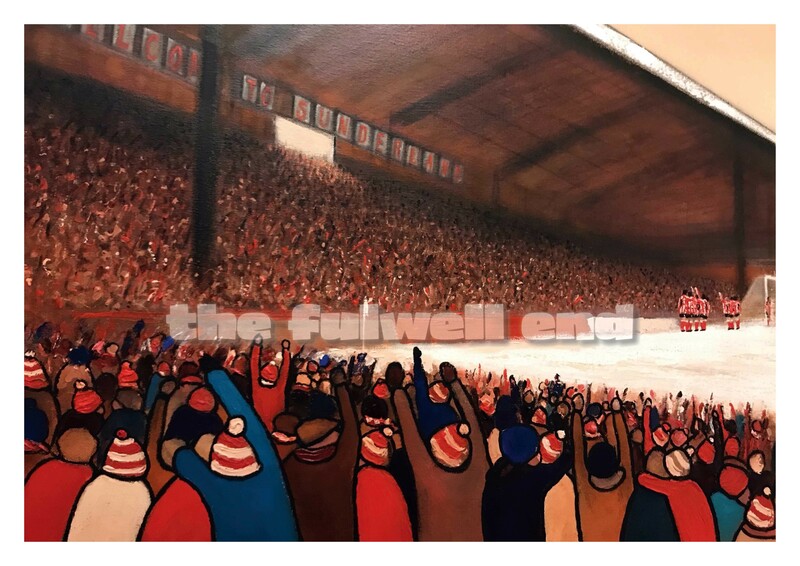 Another from Chris Cummings depicts The Fulwell End in all its packed glory. The Welcome To Sunderland sign visible at a height the players pale into insignificance beside the might of the Sunderland fans. What game could this be? It can be whatever game you want it to be. As soon as I saw this scene it took me back to a never to be forgotten day in in March 1977 when bereft of goals and wins for seemingly months the flood gates opened again and a torrent of misery rained down on our opponents. Mel Holden; “Mel Rules The Sky” was the saying, thrusting his arms upwards towards the heavens as he saluted the crowd following one of his two goals that day. The hapless victims….West Ham United, put to the sword 0 v 6. Mel is now of course no longer with us, but if you are looking in Mel, we havent forgotten you and we never will. Mel, to us, you will always rule the sky. 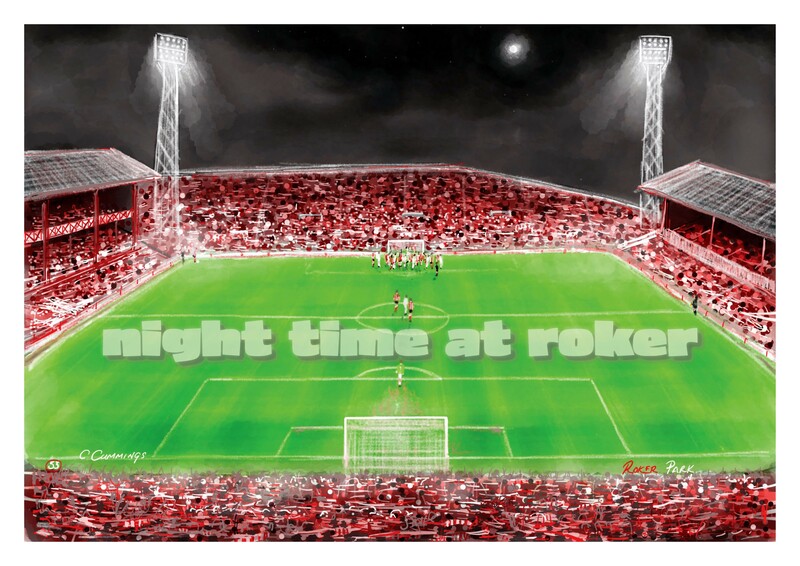 Night games at Roker Park….wow! I remember as a youngster taking my place in the children’s enclosure with my sister at The Roker End mesmerised by the aura of a midweek night time game. As you came through the turnstiles you walked towards the stairs that led onto the terraces and as you made the top of the steps, it hit you. 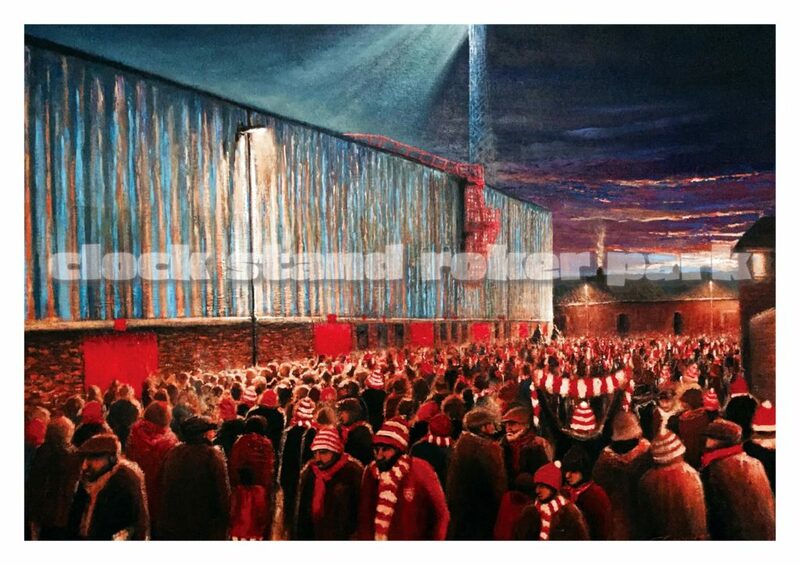 The lux value of the floodlights seemed intense, the peanut seller and the “get your programmes here” man; together with the anticipation of seeing the lads run out in the iconic red and white stripes, was overpowering. This painting captures the ground in all its glory. 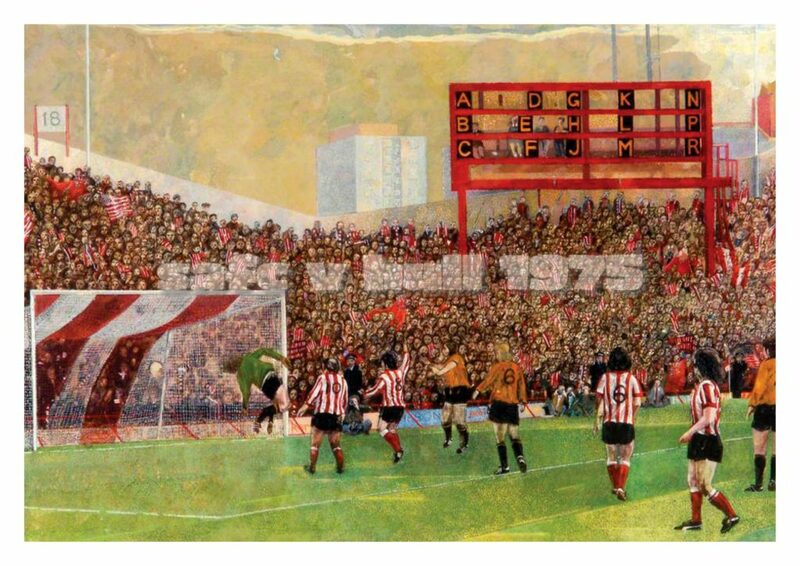 The Roker End looks its massive old self as a packed out Roker Park intimidates our unfortunate opponents. Sunderland 1 v 0 Hull City 1975? The Clock Stand gates are shut which signals that its before a Roker Park match. With anticipation running high the vast ranks of The Roker Roar moved around the stadium towards their final destination. Perhaps The Fulwell End or maybe the Roker End, or on towards the Main Stand. Who were the opponents on this night captured forever in time? It can be whom ever you want it to be. It looks cold, the fans are wrapped up warm. If someone was to ask me the one moment that stands out for me in the 47 years since my first SAFC game it wouldnt be of a particular match. What it would be would be the knowledge that I was part of a group that together makes up one of the most potent set of fans in world football. Although every club quite rightly thinks that their fans are special some can literally change the course of a game. The Roker Roar did that, and more, many times. Maybe they did it this night. It was 1985, Chelsea and all that, as we succumbed to relegation and also to a defeat at Wembley in the Milk Cup Final against Norwich. Cowies were the sponsors, the fences were up and English football fans were going through a poor time reputationally. However The Roker Roar was still there, still backing The Lads. Who is the lad in this image? Who knows. It could be you or it could be me. With his NCB donkey jacket on and his scarf knotted, it is an evocative image of the day, captured quite brilliantly by the artist. We are Sunderland Til We Die.